Cartoonist, Business cartoons, newsletter cartoons, office cartoons, work cartoons, cartoon service, golf cartoons, divorce cartoons, menopause cartoons, presentation cartoons, humorous illustration, logo design, illustration, humorous illustration. Cartoons, humorous illustration and caricatures, by one of the UK's most published cartoonists. Client include DHL, BP, Persimmon homes, Numerica, Stannah stairlifts, London Development agency, Chiltern Railways and many local authorities. 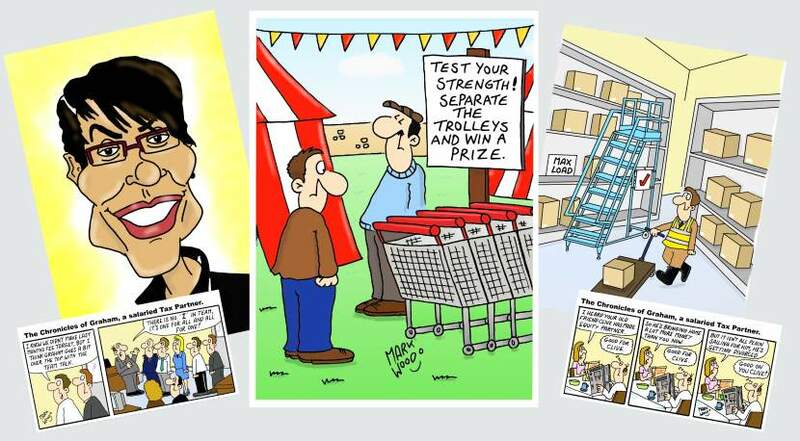 More than 200 cartoons in over 30 categories (including Business, golf, animals and diets) available for use in newsletters, presentations, magazines, newspapers and websites. Caricatures drawn from photos for birthday, anniversary, retirement gifts and much more. So whatever you need a cartoon or illustration for, if you think I may be able to help you on a project and would like a free no obligation quote, please don't hesitate to contact me. The Spectator, Private Eye, The Sun, The Times (METRO), Golf Monthly, The New Breed, New Statesman, Spectator Business,The Daily Star, Daily Mirror, The Weekly News, Bella, Wild about animals, Puzzle World and more. All cartoons and illustrations are copyright Mark Wood 2014 and may not be reproduced in any form without permission.